2. Add the mustard seeds, curry leaves and green chillies. 3. Stir-fry for 30 seconds and add the spring onions. 4. Cook till spring onions are tender. 5. Add turmeric powder, salt and vermicelli. 6. Add enough water and simmer till all water has been absorbed. 7. Add all the remaining ingredients, except onions, and cook. 9. Cook the onions with water and cook till tender. 10. Add the reserved filling inside the onion. Tip: You can either make a hole in the center or scoop out half the onion. You can also add the scooped out onions to the filling. 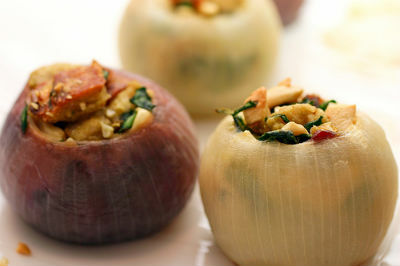 Feel free to comment or share your thoughts on this Stuffed Onion Recipe from Awesome Cuisine.